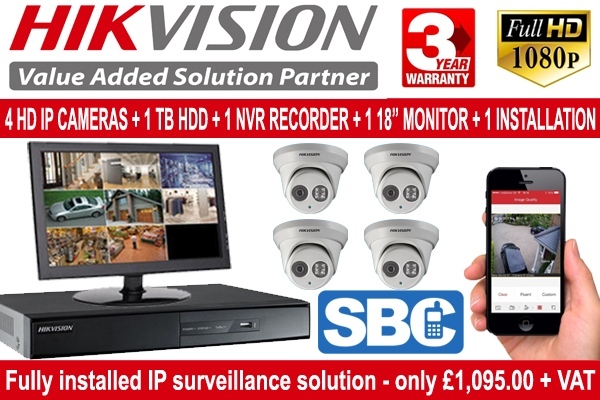 Based in Andover, Hampshire, we supply and install award-winning IP CCTV solutions throughout the UK. We ensure IP CCTV systems installed by us provide crystal-clear images, effective, reliable coverage and protection for your business. Please see our range of CCTV Installation packages below which provide the very latest technology at the most competitive prices. All of our packages come with everything you need including the NVR, 2 megapixel IP turret, dome or bullet Cameras, CAT5 Cabling, HDMI leads, Monitor and remote device setup (e.g. iPhone, Android, iPad) and network setup. 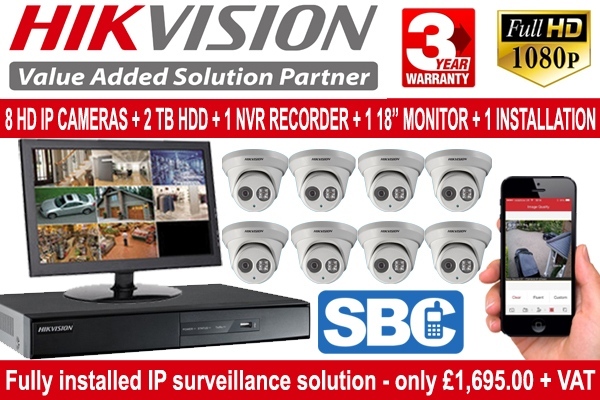 All our CCTV Systems come with 3 Years Warranty. Please complete the form below if you would like us to contact you regarding one of our CCTV Installation Packages or a custom solution. 1.1 A minimum 50% upfront payment of the package cost will be required when the order for installation is placed. 1.2 The remaining balance is payable immediately upon completion of the work by our installation engineer. 1.3 Payment is by bank transfer, debit/credit card or cash. The following payment cards are accepted: Visa, MasterCard, Delta, Maestro, Electron or Solo. The card payment is to be completed BEFORE the engineer leaves the property. 2.1 All quotes are valid for a period of 30 days. (c) Package prices apply to customers within a 50-mile radius of SP10 2JF. Additional charges may apply subject to location. TBA. (d) Your premises are in some way unsuitable for the equipment and this was not apparent during the course of the telephone/e-mail conversation or there are circumstances which we should have been made aware of. The installation work is outside the working hours of 8.00am – 8.00pm Monday – Sunday, except statutory holidays. Requests made by the customer to install outside these working hours will incur additional charges. NOTE ~ Additional charges may be made if our engineers/technicians/installers are not provided with access to doors, shutters, windows, or any other areas where cables and equipment need to be installed thereby incurring extra cable length. In any case, the customer will not be liable for extra costs beyond their reasonable knowledge. If we are unable to configure Hikvision remote viewing on the day of the scheduled installation due to IT technical issues, broadband unavailability or lack of details such as Router IP address, username and password – further charges will apply to remotely configure or revisit to complete the setup. We (SBC) cannot be held liable for client IT issues such as change of router, failed connection, change of internet service provider, re-set of the router, new mobile phone, loss of settings on the router or a new operating system. 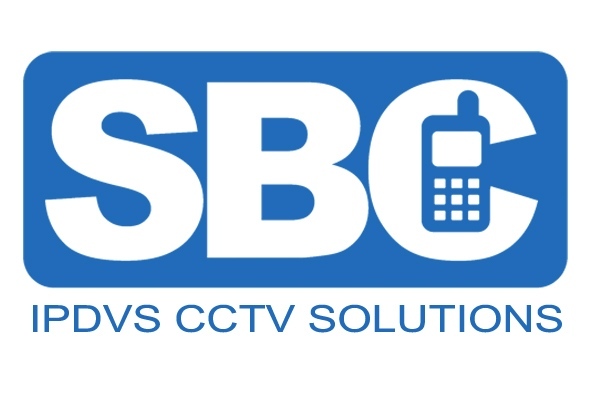 SBC remote or telephone technical support is free for the first year then an annual charge of £175.00 per year there after. Our technical support hours are Monday to Friday 09:00am to 17:00pm excluding bank holidays. 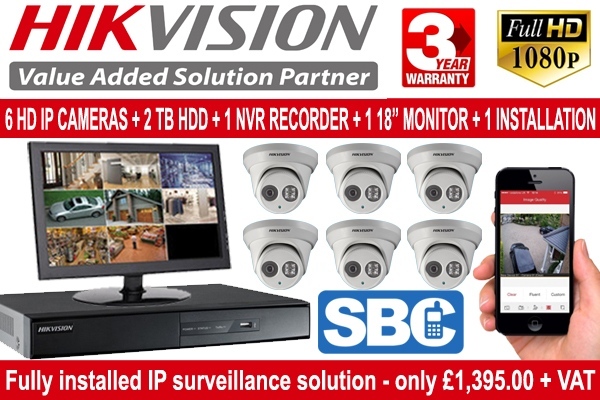 We provide a warranty period of 36 months on all our Hikvision IPDVS CCTV products. 4.1 The customer must notify us immediately of a fault occurring. You will need to provide as much information as possible, as well as the original invoice or delivery note number. Camera tampering by you or others of any part of the system. 4.3 Site visits where applicable are charged at £105.00 + VAT for the first hour then £75.00 + VAT per hour there after if the fault / malfunction caused to the system has been made by the customer and not a defective part / installation. If upon investigation there is a faulty part, this will be replaced or repaired with no charge/cost payable by the customer within the 36 month warranty period. SBC retains all right and title to any goods delivered to the Customer until the time of receipt by the company of all sums payable in respect thereof. We always aim to provide our customers with outstanding service, reliability and the best value for money. However, if there’s something you’re not happy with, we’d like you to tell us about it so that we can try to put matters right. If you want to speak to someone about a complaint or a concern, you can call us on 01264 336644 (lines are open 9:00am to 17:00pm Monday to Friday, excluding bank holidays).